Haitian artist King Kino believes all that commotion about PetroCaribe in Haiti is just a big joke. It's jut Politics. Kino says what is happening now in Haiti, it's a political fight for the 2022 elections and everyone is using PetroCaribe for their own interest. "Now is the moment where some people are using PetroCaribe to eliminate a whole bunch of other people. If you slept with someone's wife, your name will probably be included in the mix," Kino said. 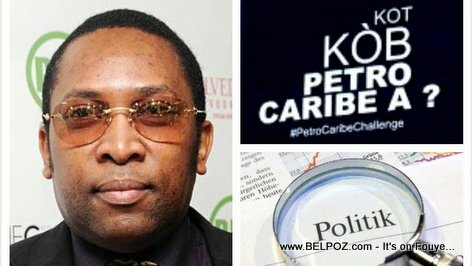 "Many people are using PetroCaribe to index people who have nothing to do with PetroCaribe. To put their name in a list." "We cannot be accusing people like that," he said. "I am not a judge, I am not an investigator, how do I know who is guilty who is not guilty? What we should do is reinforce the Haitian justice system." "Since President Jovenel said there are corrupt judges in the system. Let's force the president to put good judges so we can have a better justice system," Kino said, "this way, justice can be served and we can find out for real where the PetroCaribe money is." Kino agrees, we need to know where the money is but he things it wrong for people to be pointing fingers while they are not in the procession of any proof that the accused person did anything wrong. "I proposed that a neutral body or experts handle the PetroCaribe case," Kino said. "But if we decide to use people from the opposition to handle this, no one will take it seriously." "All this thing about PetroCaribe in the streets, this is a joke! and if we are not careful, the people will take the law into one's own hands."